I love having a little girl and one of the best parts of having a little girl is definitely dressing her up in super cute stuff! I was so excited when I opened the package from Tiny Star Couture. They had sent me adorable hair clippies and THE cutest little hat I have EVER seen! Both the hat and the clippies are very well made. The clippies stay in Olivia's hair very nicely and when she decides to grab them and pull them out of her hair only the clip comes out- the hair stays nicely put on her head where it belongs! I just hate it when she yanks out other types of clips and there is little bits of Olivia hair trapped inside... it took her two years to get hair and we don't need to be ripping it out of her head! 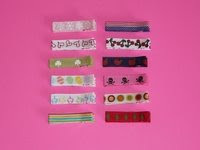 The Tiny Star Couture hair clippies come in all sorts of colours and styles to suit your little princess. And just to complete the ensemble Tiny Star Couture has adorable Princess capes and Tutus! I definitely recommend Tiny Star Couture! The little hat with the large flower is cute. It looks adorable on your daughter!